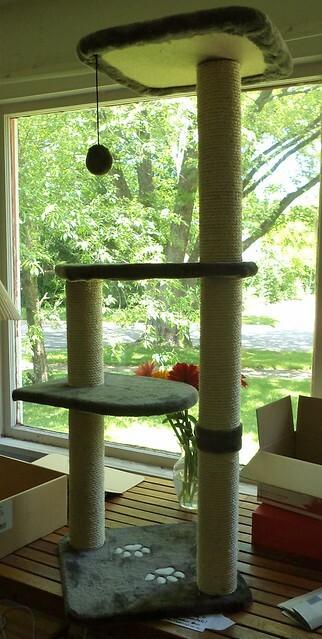 The people who had Tobey also had a cat tree for him. But because of the dog, Tobey couldn't always get down to use the litter box. . 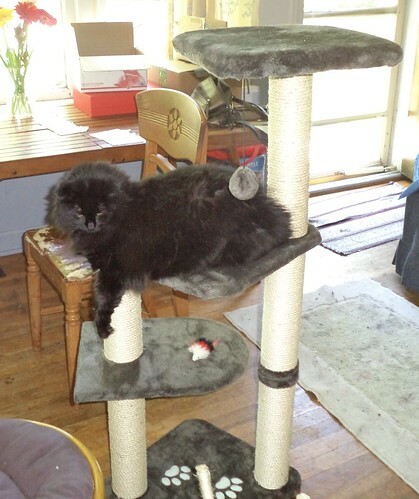 When Carole said she and Larry would take Tobey, the original owners agreed to give them the cat tree. Unfortunately, then they smelled it. 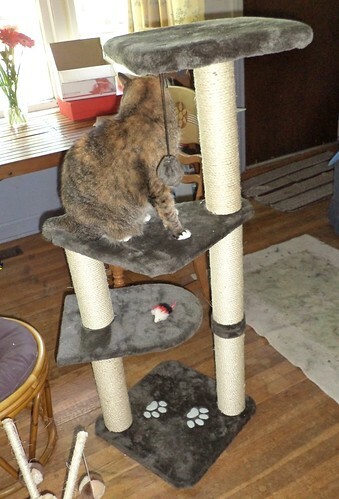 But, a deal is a deal so they bought another cat tree for Tobey. This tree, however, wasn't the sturdiest. It's smaller than the original and, given the size of both Tobey and Faux, it wobbles when either of them tries to climb it or even sit on it. So, when I was there, they offered to give it to me. My girls are smaller in size and I've often wanted to get a cat tree for them. We had to take it apart to put it in the trunk of the rental car. After sitting in pieces on the living room floor for a couple of weeks, I finally assembled it. I felt the girls needed to completely sniff it, give them some time to smell for both Tobey and Faux. I discovered I was missing a nut which holds one of the main posts to the bottom, but, because I tend to save everything, I actually had the right size nut in the basement. It's a nice size when assembled. I set it on the floor. They looked at me like, "Yeah, so, now what?" So I picked each one up and put them on the tree. We're going on a month of this sitting in the living room. They still sniff it. Mija has to be picked up and put on the tree. It's a bit wobbly even for my girls. I need to move some stuff around in the living room to put this up against a window. I think they would use it if there was something to view. I will give them treats on the levels and have found Pilchard lying on it. She saw, right away, the value of a space on which to lie down and drape one's paw over the edge. I put them on the top pad and the whole thing moves just a bit too much for my tastes but it's okay where she's lying. 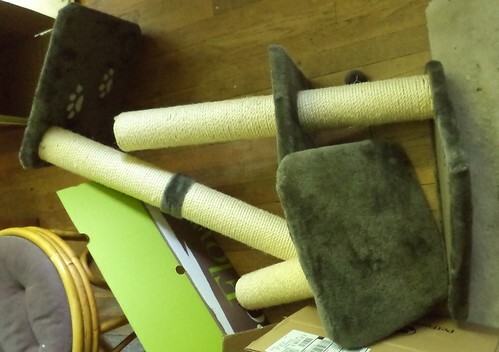 She's also discovered the posts are covered with sisal and that's fantastic for stretching and scratching. Of course, she won't scratch when I have the camera handy. Neither one really cares about the dangling ball, even when I make it move. Maybe that will be discovered, in time. This is fun for them. 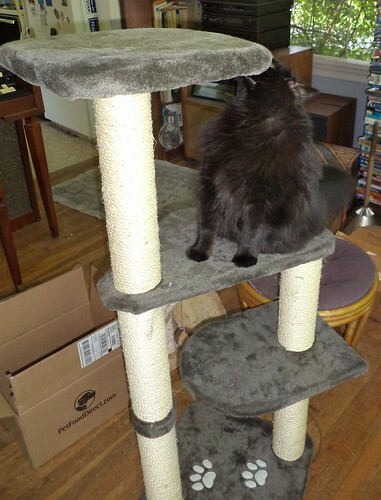 Once I figure out where to put it, I predict many long and useful days spent lazing on the cat tree. We agree, that tree looks like fun! Maybe placed against a wall so it will not wobble?